Jack, a Belfast Royal Academy Student, got involved in sport in 2006 when his parents took him to try wheelchair basketball. Seeing other athletes with similar disabilities gave him the desire to compete and following watching the London 2012 Paralympics, particularly David Weir in the 800m race he thought “I can do that”. Jack has represented GB and NI in under 18s Wheelchair basketball at the Paralympic Youth Festive in Holland as well as being selected for the Junior Wheelchair Athletes in the UK to represent team GB&NI at the Brazilian Nation Junior Paralympic Championship in Natal. Here he won 3 Gold medals in the 100m, 400m and 1500m events and is ranked top in his age group in GB. 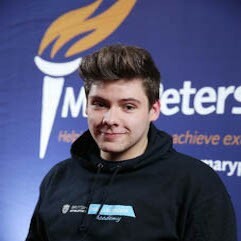 Up against competition from athletes across Northern Ireland, Jack secured the 2017 Dale Farm FutureStar Award, in partnership with Mary Peters Trust, having been recognised for his talent, commitment and focused ambition to compete at the Tokyo 2020 Paralympic Games.